Another hockey season is nearly upon us, and despite my beloved Habs inexplicably trading away last year’s playoff goaltending hero Jaroslav Halak to the St. Louis Blues, I’m pumped for the upcoming season. 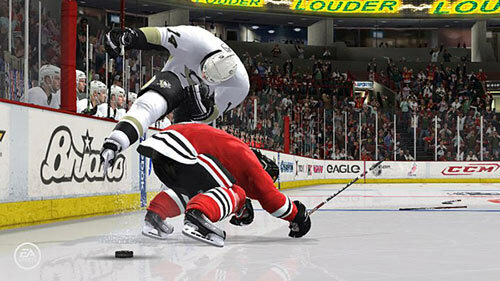 A new season also brings with it a new version of EA’s NHL series, which also gets me quite excited. I’ve played the NHL series religiously since NHLPA ’93, and even won a small NHL 94 tournament at a local video game store back in the day. It seems like every year I wonder whether they can truly add any more to the game and top themselves yet again, and yet EA has managed to do it with flying colors with NHL 11. The core game plays very similarly to the most recent installments, and the graphics aren’t greatly improved, but beyond that, there’s a wealth of new features and enhancements. The CHL? The Memorial Cup? Come Again? For fans outside of Canada, the addition of Canadian Hockey League teams and the ability to play a full CHL season and Memorial Cup championship may not seem like that big of a deal, but for fans in Canada it most definitely is, and there are added benefits from this addition to other modes of the game as well, specifically the Be a GM mode, which is now far more robust and realistic for all gamers. For fans in Canada, many of whom have grown up watching and rooting for one CHL team or another, it’s a mode that offers some great nostalgia. Playing as my hometown Kitchener Rangers at my old stomping grounds, the Kitchener Memorial Auditorium was quite a thrill. I would not be surprised in the least if many Canadian gamers play the CHL mode as much as they do the NHL mode. Another new mode is the Ultimate Team mode similar to what was seen in Madden NFL 11, which is quite fun and addicting. By collecting EA pucks through gameplay, you can purchase card packs which can contain players among other things like arenas and skill boosts. These players can then be added to your team, where elements like chemistry come into play to determine the best team and lines possible. It’s a mode that sounds somewhat blasé on the surface, but is actually quite enjoyable to tinker with. Game enhancements come in the form of improved A.I and a revamped physics engine, which have both made large strides from previous years. The A.I is far more realistic and creative than we’ve seen in the past, both the A.I of your opponents and the A.I of your other line-mates. This makes for a game with far better flow. It’s notable how much better your own teammates play with you, making the game less of a one-man show. The improved A.I also makes the Be a Pro mode, where you only control one player in the game, far more appealing than it has been in the past. The controls are also as slick as ever, offering pinpoint precision on your passing, a wealth of dazzling moves to pull off with the right stick, and more ways to trip, check, or slash your opponents than ever. The commentary team remains the same from recent years, and I have to say, I’ve never really liked this duo of Gary Thorne and Bill Clement. I would much rather see the return of Jim Hughson, or even see EA take a shot on a new commentary duo. The music is typical EA Sports fare, consisting mostly of some good indie rock to go with some bad, as well as some tracks from a few more notable bands. While I haven’t been able to spend as much time on NHL 11 as I have on previous entries, it’s not due to any shortcoming on the game’s part. NHL 11 could very well be the best hockey game ever created, and will again prove a challenge for EA to top come next year. Yet somehow, I think they’ll go ahead and do just that. Fifa On PS4 and Vita? Bring back the celebrations of winning games and the Stanley cup. It's so boring you win the cup and all it says is congratulations. Not sure who made the games before EA sports but i enjoyed watching the celebration moments of winning the Stanley cup team picture and all it might have been NHL 2002. Totally agree, I think winning it all deserves some more fanfare. Granted I haven't won the cup on '11 yet, so I can't say what happens. Something like better on-ice celebrations after the final win, and maybe a victory parade through your city after, would be a nice reward for all the hard work. And if you're playing in a multi-season mode, how about a banner raising ceremony at the first home game of the next season? Now that would be a better reward (the banner could even stay in the arena throughout your dynasty, and show up whenever they scan the rafters).